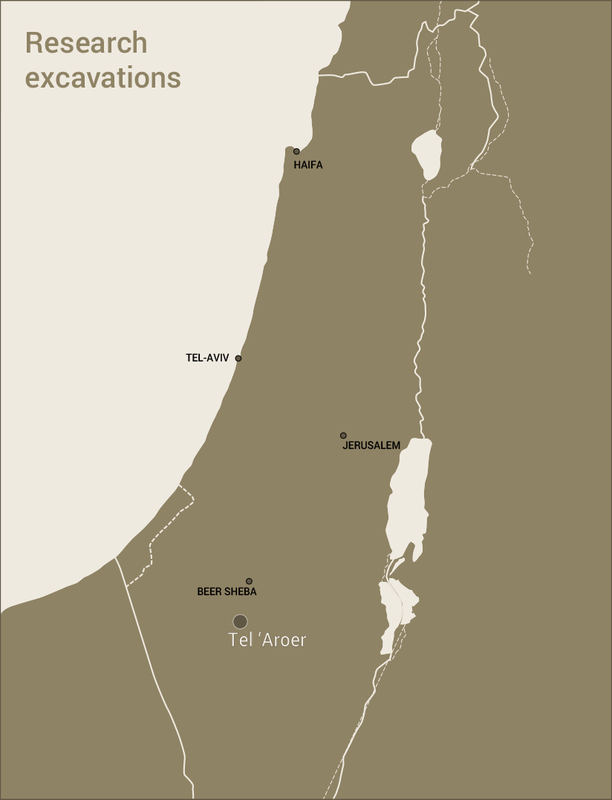 Tel ‘Aroer is located on the banks of the ‘Aroer stream in the southernmost part of the Beersheba-Arad Valley, about 22 km (15 miles) southeast of modern Beersheba (map reference 1479.0623). Tel ‘Aroer was first identified by Edward Robinson as biblical ‘Aroer (I Sam. 30: 26-28). 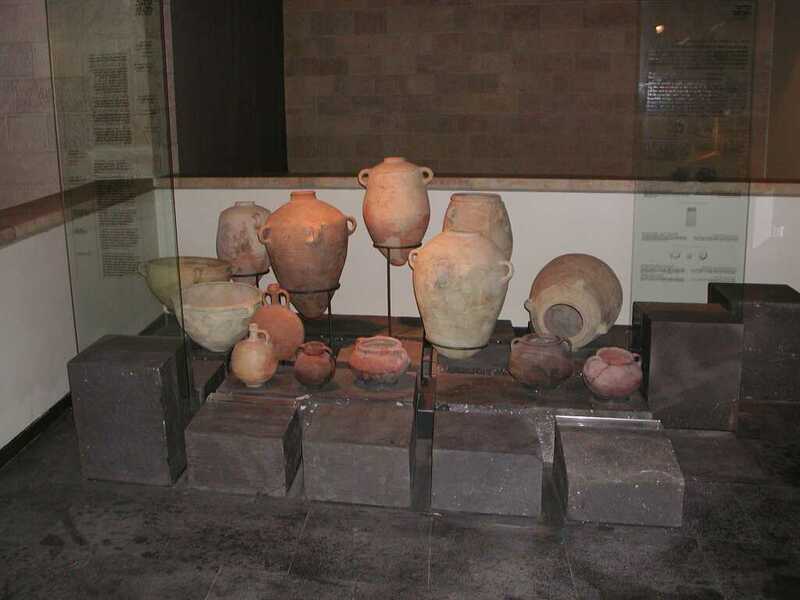 The site was first excavated in 1975 under the direction of Avraham Biran, director of the Nelson Glueck School of Biblical Archaeology (NGSBA), and Rudolf Cohen of what was then the Israel Department of Antiquities and Museums (IDAM). Additional short seasons took place between 1976 and 1978 and between 1980 and 1982, under the direction of Biran alone. The site is ca. 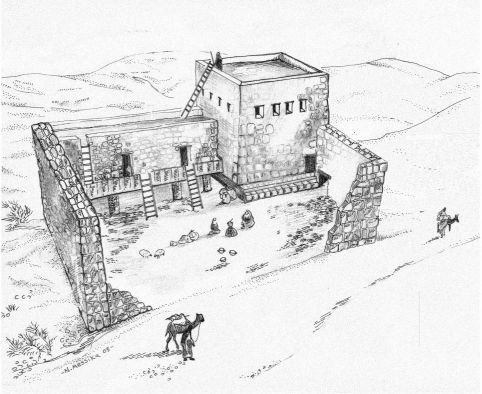 20 dunams (2 hectares) in area, 10 dunams of which are located outside the fortifications in the lower part of the site. Six main fields were opened: Areas B, H and Y inside the fortifications, Areas A and D outside the walls and Area C on the lower part of the mound.Two main periods of occupation are represented: the Iron Age IIb-c, from the 8th century BCE until the beginning of the 6th century (Strata IV-IIB), and Roman period, from the 1st century BCE to the early 2nd century CE (Strata Ic-Ia). 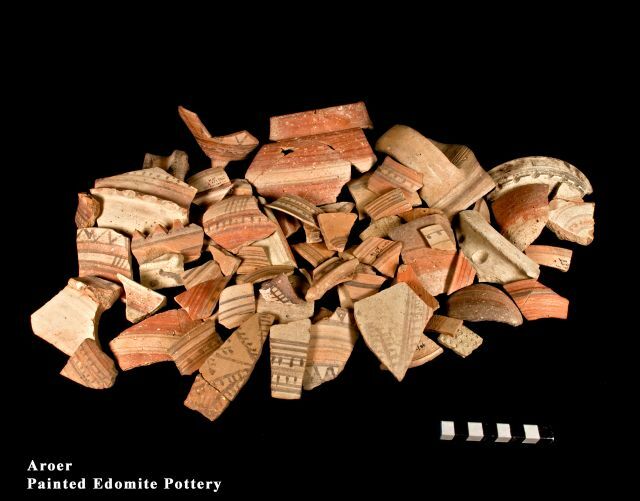 Tel ‘Aroer is one of the most important Iron Age II sites in the biblical Negev; the ceramic and small find assemblage appears to be extraordinarily rich, including Judean, Coastal and Edomite pottery, as well as imitations of Assyrian Palace Ware. Other significant finds of the period include figurines, a bone plaque with proto-aeoloic capital, commercial sheqel weights and several inscriptions, a seal and seal impressions, in Hebrew, Edomite and southern Arabian scripts. Reconstruction of the different architectural elements and their material culture contents indicates a variety of social elements (“ethnicities”) and wide-ranging connections with Assyria, Edom, Judah, Israel, south Arabia and the Mediterranean littoral. Aside from architectural elements dictated by the central power of the territorial state (Judah), the town of ‘Aroer incorporated institutions specifically adapted its economic function and to its cultural inclinations. These elements include a caravanserai for passing caravans (Area A), an extramural commercial zone and mercantile quarters (Area D) and a security post (Area C). The importance of ‘Aroer in the Iron Age derives from its strategic location on the trade route that ran from South Arabia through Edom, the ‘Arava, the Beersheba Valley, the western Negev, and on to the coast. On the one hand ‘Aroer was a desert town, probably accommodating desert natives adapting to conditions of aridity and distance from centers of population. But ‘Aroer was also a center of commerce and administration and, as such, represents an island of social complexity and multi-culturalism. ‘Aroer was destroyed in the early 6th century BCE and only resettled in the Hellenistic period (Stratum Ia), probably as part of the Idumean or Nabatean mercantile system. This settlement became more substantial in the early Roman period, when a fort was constructed and a small village grew up around it (Stratum Ib), probably at the instigation of one of the Judean kings (Herod Agrippa I?). After the site’s destruction in the Great Revolt in 68 CE the settlement was rehabilitated somewhat, lasting until its final destruction and abandonment in 135 CE at the end of the Bar Kochba revolt. 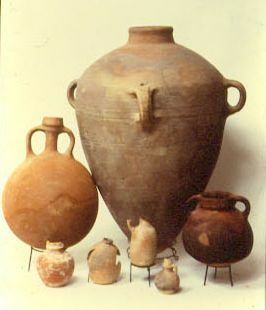 Outstanding finds of these later periods are Jewish stone vessels, decorated Nabatean pottery, glass vessels, Aramean and Greek inscriptions, a copper bell and a number of coins.